"Machines for living:" for various critics, including Tom Wolfe, the Pruitt–Igoe housing project illustrated both the essential unlivability of Bauhaus-inspired box architecture, and the hubris of central planning. High modernism (also known as "high modernity") is a form of modernity, characterized by an unfaltering confidence in science and technology as means to reorder the social and natural world. The high modernist movement was particularly prevalent during the Cold War, especially in the late-1950s and 1960s. In The Blank Slate, Steven Pinker remarked that the appreciation and collection of art is a behaviour involving the seeking or maintenance of social status. In the days before photography and other means of mass production and copying made decorative art objects accessible in some form to a wider audience, art conoisseurship could acquire its status from the sheer scarcity of art objects. When these technologies threatened to remove scarcity from art objects, a rarefied, austere and hermetic aesthetics began to become more and more influential in the arts. Since art objects could no longer confer status by mere rarity, an alternative ground had to be sought for their social prestige: this prestige was now to be sought by deliberate exclusion of the tastes of the masses and by creating austere works of art that could only appeal to the tastes of an elite who had been educated to understand them. This austerity program is one meaning of "high modernism" in the arts. High modernism is exemplified in the writings of Clement Greenberg, who developed and promoted an opposition between "avant-garde" art and what he dismissed as "kitsch". High modernism especially compasses diverse movements such as abstract expressionism in the plastic arts, followed by the minimalism and the austere cultivation of "flatness" embraced by Piet Mondrian and his successors. In music, the twelve-tone compositions of the Second Viennese School and especially their post-World War II followers such as Milton Babbitt expressed the astringent qualities associated with high modernism. Babbitt's well known essay Who Cares if You Listen praises "efficiency" and "simplification" as two of the virtues sought by serial music. 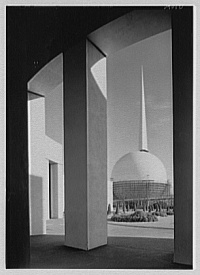 In architecture, the International Style of uniformly rectangular, unornamented chrome, concrete, and glass buildings, as pioneered by Ludwig Mies van der Rohe, Walter Gropius and the Bauhaus, and Le Corbusier, are thought to be an expression of the austerity associated with high modernism. Le Corbusier famously called his austere white buildings "machines for living". The "International Style" called itself "international" precisely because its exponents cultivated indifference to location, site, and climate. . . a strong, one might even say muscle-bound, version of the self-confidence about scientific and technical progress, the expansion of production, the growing satisfaction of human needs, the mastery of nature (including human nature), and above all, the rational design of social order commensurate with the scientific understanding of natural laws. Scott sees "high modernism" as an ideology that transcends the traditional divisions between the political "left" and "right"; it could be found wherever anyone wished to use state power to bring about utopian changes in people's work habits, living patterns, moral conduct, or worldview. High modernism accepts the "blank slate": it believes that human beings and human societies can be successfully reordered by planners at will. It requires a centralized bureaucracy to gather information about people and places, which it conceives of as human and physical capital. It finally requires the existence of a state powerful enough to enact its plans upon the lives of its subjects. It involved the imposition of order upon cities, villages, and farms by planners. Engineers, architects, scientists, and technicians of various sorts were its chief implementers. Scott's use of "high modernism" calls to mind bureaucrats imposing standardization, indifferent to the nuances of local cultures. In his vision, they blindly crush communities and local, organic institutions and cultures as inconveniences in the quest for central planning. In this, he draws on the thought of Jane Jacobs and her critique of urban renewal and planning. In Scott's view, "high modernism" is any of a number of elitist ideologies that must be imposed by officials who imagine that they know better than local people do about how to arrange their lives. Planners seek to impose "legibility" and "simplification" on their subjects; as a result, governments require everyone to use the same system of surnames, erase local systems of weights and measures in favour of uniform, promulgated standards, and statistical tests that measure what is of interest to the rulers rather than the people whom they govern. and occasionally Samuel Beckett (usually described as an absurdist) and Joseph Conrad (most of whose work both predates the generally accepted time-frame of high literary modernism). Tom Wolfe's two books of art criticism, The Painted Word (Bantam, 1975: ISBN 0-553-38065-6), on painting, and From Bauhaus to Our House (Bantam, 1981: ISBN 0-553-38063-X), on architecture, are readable if satirical tours of the theory of high modernism for laymen. Unless indicated otherwise, the text in this article is either based on Wikipedia article "High modernism" or another language Wikipedia page thereof used under the terms of the GNU Free Documentation License; or on original research by Jahsonic and friends. See Art and Popular Culture's copyright notice. This page was last modified 09:36, 10 November 2014.